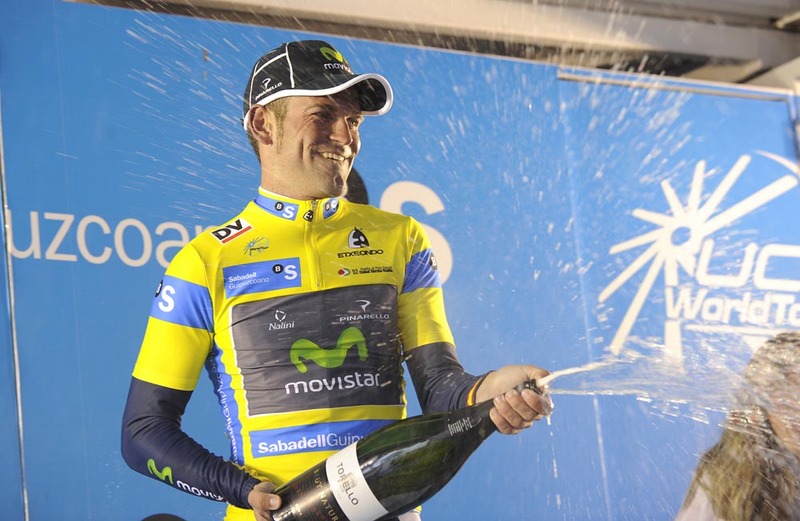 Daryl Impey (GreenEdge) won a rain-swept stage two of the 2012 Vuelta al Pais Vasco on Tuesday from a late attack. Impey’s perfectly-timed move saw the peloton helpless in its efforts to catch him in the final kilometre. Impey’s GreenEdge team-mate Allan Davis then won the bunch sprint for second place. Davide Appollonio took third for Sky. Stage one winner Jose Joaquin Rojas (Movistar) placed fourth to hang on to the overall lead. Thibaut Pinot (FDJ-BigMat), Jerome Pineau (Omega Pharma-QuickStep), Mads Christensen (Saxo Bank), Gabriele Bosisio (Named Utensilnord) and Julian Sanchez (Caja Rural) were the breakaway men of the day, but were swallowed up by the peloton within the final 15km. Dominik Nerz (Liquigas-Cannondale) then had a dig on the final, third category climb of the day. His efforts were quickly curtailed by Astana, who massed at the front of the bunch. Astana then kept control on the descent, dictating the pace as the race closed in to the finish. Astana’s grip on the group then loosened under the flamme rouge, as Daryl Impey (GreenEdge) launched an attack as the race strung out around a roundabout. It was perfect timing. The South African rapidly opened up a gap in the stiff headwind and kept it until the line, with the peloton appearing to move in slow motion behind him. Wednesday’s stage three offers up a challenge for the climbers. The final climb of Alto de Usartza lies just two kilometres from the finish in Eibar, which should see the overall classification of the WorldTour race receive a shake-up. The 2012 Vuelta al Pais Vasco concludes on Saturday, April 7 with a 18.9km individual time trial in Onati.